Many of today’s CBR systems are passive in nature: they require human users to activate them manually and to provide information about the incoming problem explicitly. In this paper, we present an integrated system that combines CBR system with an active database system. Active databases, with the support of active rules, can perform event detecting, condition monitoring, and event handling (action execution) in an automatic manner. The combined ActiveCBR system consists of two layers. In the lower layer, the active database is rule-driven; in the higher layer, the result of action execution of active rules is transformed into feature-value pairs required by the CBR subsystem. 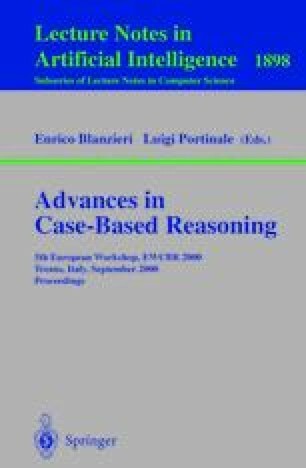 The layered architecture separates case-based reasoning from complicated rule-based reasoning, and improves the traditional passive CBR system with the active property. This paper shows how to construct ActiveCBR system and provides an analysis of the resulting system architecture.